The holidays are a rough time of year for a lot of people that are trying to stay on track with a healthy diet. Once the Christmas dinners and treats come out, this is when things get a little out of control around this time of year. I am here today with one way you can help kick off a healthier lifestyle: a superfood powder! There are many on the market, but I trust HUM Nutrition because I am a big fan of their other supplements that I have been using. 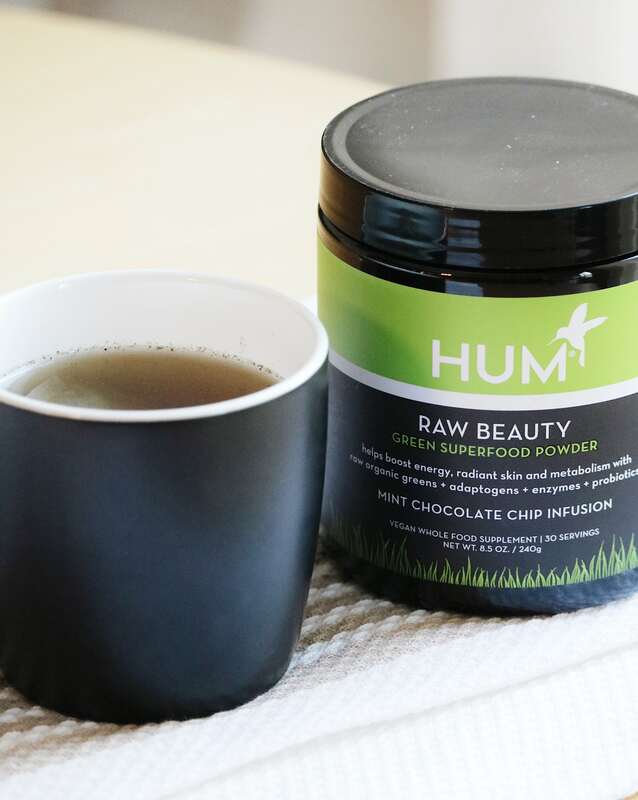 Raw Beauty is a superfood powder that you can mix into your favourite drink to get the benefits of the daily raw greens. Instead of adding regular flavouring to your water, this powder adds health benefits that can help you in multiple ways. There are 39 different beauty detox superfoods in this power. Yes that’s right: 39 superfoods! They help improve your energy, promote radiant skin, and boost your metabolism. As a bonus, it has a mint chocolate flavour, so you can continue your holiday-appropriate flavours. I am a big mint chocolate fan, so this flavour works year-round for me. They also have a Tahitian Vanilla and Berry version if that sounds more appealing to you. Green Superfood Blend and More! This powder is advertised as a green powder for a good reason. The Green Superfood Blend contains many organic ingredients, such as barley grass, wheat grass, chlorella, spirulina, and alfalfa grass juice. These ingredients contain essential amino acids and helpful enzymes. They protect energy, metabolism, and skin, as well as helping detoxifying your body. Other ingredients include licorice root powder, American ginseng root powder, and so many others that are beneficial to your health. You get antioxidants, adaptogens, enzymes, probiotics, and fibre, all from just mixing 1 scoop into your favourite drink. Only 25 calories and no artificial flavours added. Add a scoop of this powder to your tea to add an extra bit of flavour and a lot of health benefits. Add a scoop to your smoothie or smoothie bowl. The flavour will likely not be affected depending on which type of smoothie you’re making. As a matcha latte lover, I find that adding a scoop to my matcha lattes gives a slight bonus of a mint chocolate flavour without taking away from the original matcha goodness. Adding a scoop of the powder to my lattes helps provide a bit of flavour with using any syrups. I hope this helps stir up some ideas in your mind about how you can use this superfood powder! If you’re going to kick-start any healthy habits, now is the perfect time to do it! You can read my other blog post about HUM Nutrition as well by clicking here.